What are the options after metformin? Rational pharmacological intervention is essential for optimising glycaemic control in patients with type 2 diabetes. Metformin is the recommended first line agent, but the progressive pathogenesis of type 2 diabetes generally dictates the need for concomitant use of other drugs. Here, Caroline Day discusses the options following metformin monotherapy. Dr Caroline Day, Visiting Fellow, School of Life and Health Sciences, Aston University, Birmingham. treatment with diet/lifestyle strategies in patients who are close to target and likely to respond to this approach.5,6,7 However, metformin is recommended as an initial treatment in combination with lifestyle changes in those less likely to be adherent, while in those with greater hyperglycaemia (HbA1c 9-10%, 75-86 mmol/mol) commencement of treatment with metformin and another oral glucose lowering agent is recommended. 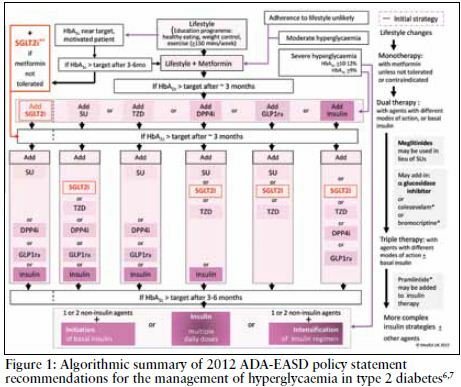 Patients with severe hyperglycaemia (HbA1c >10%; 86 mmol/mol) should be initiated on insulin therapy alone or in combination with other glucose-lowering agents. Since the publication of the latest consensus a new class of oral glucose lowering agents has been approved in Europe – the SGLT2 inhibitors. The first-in-class agent dapaglifozin has been added to the summary algorithm herein (Figure 1), but it has yet to be included in any of!cial guidelines. It is recommended that if an individualised glycaemic target is not achieved or maintained, move promptly to the next therapy level using a patient-centred approach to drug selection) *Not licensed in Europe for the treatment of type 2 diabetes **Dapagliozin is the .rst-in-class SGLT2 inhibitor licensed in Europe for the treatment of type 2 diabetes (note it is not recommended for use in combination with pioglitazone and there are no reported data on combination therapy using dapagliozin and a GLP-1ra) DPP4i = dipeptidylpeptidase 4 inhibitor; GLP-1ra = glucagon-like peptide-1 receptor agonist; SU = sulphonylurea; SGLT2i = sodium glucose co-transporter 2 inhibitor; TZD = thiazolidinedione . HbA1c: 9% = 75 mmol/mol; 10% = 86 mmol/mol; 12% = 108 mmol/mol. People with type 2 diabetes are not as simple to treat as an algorithm would suggest. They tend to be older, have other components of the metabolic syndrome, such as hypertension and dyslipidaemia, and are often on multiple medications to reduce cardiovascular risk (as primary or secondary prevention), or to treat other diabetes-associated conditions as well as other chronic conditions and intercurrent ailments. Ageing brings reduced physiological efficiency, some aspects of which may be of individual importance. Thus the choice of which drug to add to metformin therapy essentially depends upon the individual being treated. Sulphonylureas are generally accepted as initial choice of add-on therapy to metformin as, provided there is adequate beta cell function, the addition of a sulphonylurea allows patients to rapidly achieve glycaemic targets. However, sulphonylureas are associated with hypoglycaemia and associated risks such as falls, and it has been suggested that fear of hypoglycaemia reduces compliance. The use of add-on meglitinide treatment offers rapid-onset and very short duration of insulinsecretion which reduces risk of hypoglycaemia and these agents are not associated with weight gain. Addition of a DPP4 inhibitor offers similar benefits with the benefit of once-daily dosing (with the exception of vildagliptin which is bd). In November 2012 the selective reversible SGLT2 inhibitor dapagliflozin was granted marketing authorisation in Europe for use in type 2 diabetes patients inadequately controlled with lifestyle strategies alone or in combination with other antidiabetic agents, including insulin – although studies on dapagliflozin in combination with a GLP-1ra (glucagon-like peptide-1 receptor agonist) have not been reported. Dapagliflozin as monotherapy is only considered in patients in whom metformin is inappropriate. Dapagliflozin acts by inhibition of SGLT2 transporters. These are located almost exclusively in the renal proximal tubule where their role is to reabsorb glucose back into the circulation. Mr R, a married 55 year old bus driver of African origin was diagnosed with hypertension 4 months prior to presenting complaining of lethargy, thirst, nocturnal polyuria. He was obese (BMI 32), +ve for urinary protein, his blood pressure 137/80 mmHg (treated with amlodipine 10mg od). Blood analysis revealed total cholesterol 6.5 mmol/L, urea 6.1 mmol/L, creatinine 114 .mol/L, and a random finger stick glucose 24 mmol/L. Mr R was given diet and lifestyle advice and commenced on metformin (500mg od titrated to tds). Simvastatin (20mg od) and aspirin (75mg od) were prescribed to address his increased CV risk, noting the reduced dose of simvastatin due to amlodipine therapy. Despite compliance with his treatment, some of his troubling symptoms persisted, and glycaemic control remained inadequate (fingerstick glucose 14mmol/L). Mr R was agreeable to increasing his medication in an effort to improve his glycaemic control, but stressed that he didn’t want to take any medicines which might compromise his work situation. Although he had ‘come out’ at work he was fearful of his treatment jeopardising his job. Thus treatment options were limited to those which would not cause hypoglycaemia (i.e. avoid suphonylureas and insulin). Mr R admitted that his diet was generally low in complex carbohydrates – deleting acarbose as an option. Due to shift work and bus schedules his eating patterns were unpredictable (timing, quality and quantity) – discounting addition of a meglitinide. Media scares surrounding the TZDs eliminated consideration of pioglitazone. He expressed an interest in taking a GLP – 1ra as he had read online blogs praising the drug for helping them to lose weight. His enthusiasm evaporated when he realised it was only available as an injection; he didn’t want the hassle of using a needle, even if only once a week, if he could take a tablet. In attempting to select an add-on therapy that would be appropriate to Mr R’s work situation and preference (to encourage adherence) therapeutic options were limited to use of a gliptin (DPP-4 i) or glucuretic (SGLT2 i) as neither is associated with hypoglycaemia or weight gain. Mr R had been a regular drinker but since having a bout of pancreatitis 10 years ago he now only had a drink at special events such as weddings. However this raised a caution with regard to prescribing a gliptin. Thus it was decided that Mr R would commence treatment with add-on dapagliflozin (10mg od). It was explained to him that it is a new type of agent, so we would like to see him more regularly than if he was taking a drug for which there is extensive clinical experience. He was also advised that some people had experienced more urinary tract and genital infections when taking this drug. Nevertheless, he was keen to try the new agent – essentially because of its potential to help with weight loss. 2 Bailey CJ, Turner RC. N Engl J Med. 1996;334:574–9. 3 UK Prospective Diabetes Study (UKPDS) Group. Lancet. 1998;352:854–65. 4 Holman RR, Paul SK, Bethel MA, et al. N Engl J Med. 2008;359:1577–89. 5 Inzucchi SE, Bergenstal RM, Buse JB et al. Diabetologia 2012;55:1577-96 and Diabetes Care 2012;35:1364-79. 7 Day C. Br J Diabetes Vasc Dis 2012;12:146-51. 8 Bailey CJ, Day C. Br J Diabetes Vasc Dis 2010;10:193–9. 9 Day C, Bailey AV. Br J Diabetes Vasc Dis 2013,13:2-6. 11 Emslie-Smith A, Dowall J, Morris A. Br J Diabetes Vasc Dis 2001;3:54-56. 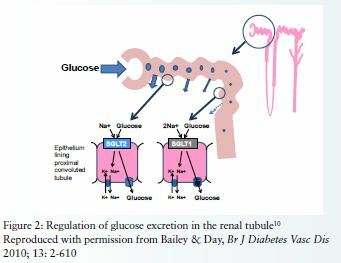 13 Bailey CJ, Day C. Br J Diabetes Vasc Dis 2012;12:2-5. 16 Ryder REJ. Br J Diabetes Vasc Dis 2011;11:113-120. 18 UK Prospective Diabetes Study (UKPDS) Group. Lancet 1998;352:837-53.